Did you know that, when searching for a home for rent or sale on MilitaryByOwner.com, you can filter your search for the age of a house? You can also view historic homes across the country by simply typing the word "historic" in the search bar on our new responsive site! The allure of a grand, historic home on the National Register of Historic Places may be too tempting for some buyers to pass. Other buyers won’t even consider the possibility of the upkeep and likely renovations needed. There is an attitude or way of life that accompanies owning a historic home. To get past the expense of repairs for the cracks in the original plaster walls, owners have to buy into the fact they are preserving history and maintaining a small piece of American tradition for future generations, particularly if it is located in a historic district surrounded by others. The pros and cons of a historic home purchase seem to be evenly split; you just have to know your reno/rehab personality. There are several HGTV series that show the agony of unanticipated costs, but at the end of every episode, the homeowners always say it was worth the extra money and effort. Is this TV magic or renovation reality? Your historic home may not be on the National Register, as it is a lengthy process, but many of the issues remain the same. The cliché, “They just don’t make them like they used to” prevails. Unique, detailed craftsmanship will be superior. Exceptional architecture and design are often the main reasons buyers seek old homes. Opportunities for tax relief and grant options from the federal government as well as state and local entities. There is a high likelihood of substantial return on investment. Historic districts regularly maintain high property values. Any changes in neighborhood homes or zoning will be reviewed by a local historic board to ensure the integrity of the location. Historic districts generally have established and mature landscapes. Homeowners will often invest in gardens with period plants or design. Restrictions, restrictions, and more restrictions. The intent of a historic property is to maintain the period and authenticity of the home. Adding square footage is almost never done, and local regulations will be tight regarding everything from shutter style to roofing material and color of exterior paint. Energy consumption and utility bills will most likely increase. It takes a lot to heat and cool an old home. Because they are no longer made, replacement materials original to the house will be expensive and difficult to obtain for projects. Homeowners' insurance will be costly, if available at all, for certain types of policies such as replacement cost coverage. Old homes go hand in hand with plumbing and electrical problems. Ever hear of the dreaded knob and tube wiring? 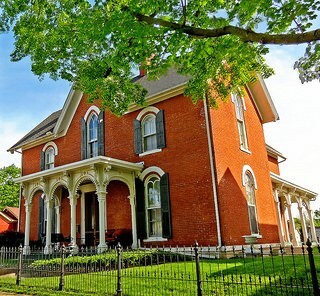 Would you consider buying a home on the National Register of Historic Places? Or would an older home with less of a title suit your family just fine? Be sure to check out MilitaryByOwner's advanced search feature limiting the age of the house!